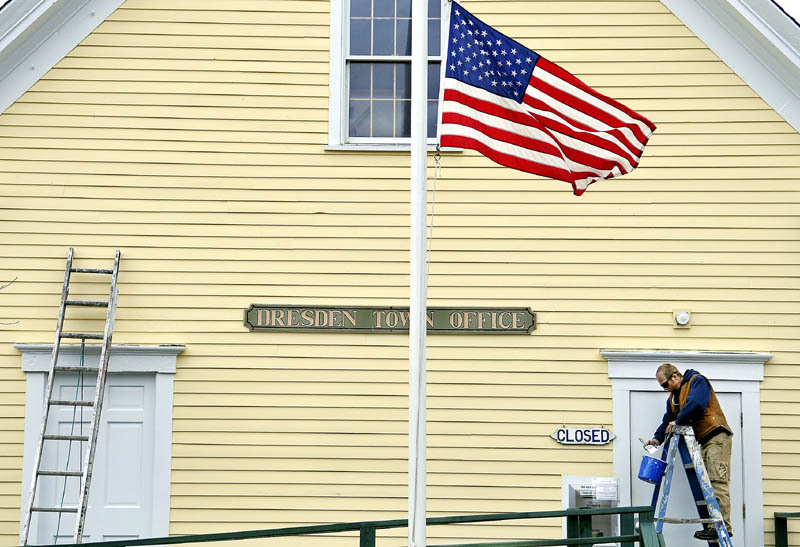 Joe McKenna touches up his brush Thursday while applying a coat of paint to the exterior trim of the Dresden Town Office. A crew from Tom's Painting Service has applied a new coat to the exterior of the former, one-room school that was "built way back," according to Dresden town administrative assistant Trudy Foss. Joe McKenna touches up his brush Thursday while applying a coat of paint to the exterior trim of the Dresden Town Office. A crew from Tom’s Painting Service has applied a new coat to the exterior of the former, one-room school that was “built way back,” according to Dresden town administrative assistant Trudy Foss.